‘The Bachelorette’ finale aired last night, and it was one for the ‘The Bachelor’ history book. 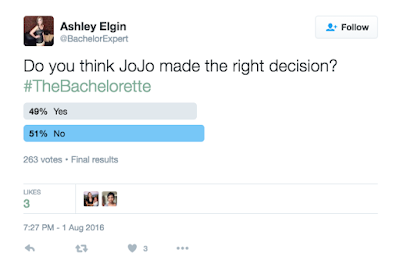 I have to admit I wanted JoJo Fletcher to be the Bachelorette more than anyone, I even predicted it. However, there was a difference in liking JoJo as the lead and buying into the finale. Jordan seemed to hesitate a lot, but that could have seemed more extreme, because Robby was so in love with JoJo. It was easy to see early on that she was the most interested in Jordan, if anything, Luke seemed as if he would be the runner-up. When he went home after hometowns, it was Jordan’s game to lose. The most surprising part of the finale was when Jordan didn’t originally ask JoJo’s parents for her hand in marriage. While that may not be a definitive tradition, it was important to her and made him look unsure. Luckily, Neil Lane showed up, Jordan picked out a ring and he called her parents. I asked my Twitter followers, if JoJo made the right decision and while it was a close poll, the majority said no. Do you feel JoJo made the right decision? I can't wait to Tweet 'Bachelor in Paradise' with you all. Having just got married last week, I was eager to tell everyone about this place. We had the perfect wedding at Seattle Wedding venues, thanks to their amazing service. Most places don’t care and charge you for a lot of the things that guys at this place were willing to help us out with.